Proton pump inhibitors는 널리 사용되는 약제입니다. 최근 간질환 환자에서 PPI사용에 대한 주목할 만한 연구결과들이 있어 소개합니다. Many patients with chronic hepatitis C (HCV) are on prolonged proton-pump inhibitor (PPI) therapy, and wish to remain on PPI therapy once treatment for HCV starts. A preliminary report recently suggested decrease rates of sustained virologic response (SVR) for patients taking concomitant PPI and Ledipasvir/Sofosbuvir (LDV/SOF). We sought to determine the effect of PPI use on the rate of SVR in a real-world cohort of 1,979 patients with chronic HCV treated with LDV/SOF. We collected clinical data and pharmacy dispensing records on patients taking 8, 12 or 24 weeks of LDV/SOF±Ribavirin. The primary outcome was SVR12 in a per-protocol analysis in order to determine the effect of PPI use adjusted for confounders. Statistical adjustment was performed in propensity-matched analysis. In the per-protocol analysis, SVR12 was achieved in 441 (97.1%) of PPI recipients compared with 1497 (98.2%) in PPI non-recipients (p = 0.19). Neither low nor high dose PPI was associated with decreased SVR. Although, patients taking twice daily PPI achieved a lower SVR12 rate: 91.2%, CI (77.0 - 97.0, p = 0.046). After propensity-matching for PPI use, there were no significant associations between SVR12 and any dose or frequency of PPI use. However, in a sensitivity analysis focusing on patients with cirrhosis, twice daily PPI use was associated with lower odds ratio for SVR12 0.11 95% CI (0.02 - 0.59). Conclusion These data from a cohort of real-world patients receiving anti-HCV therapy with LDF/SOF±Ribavirin support the prescription labeling suggesting that patients take no more than low dose (20 mg omeprazole equivalents) PPI daily. 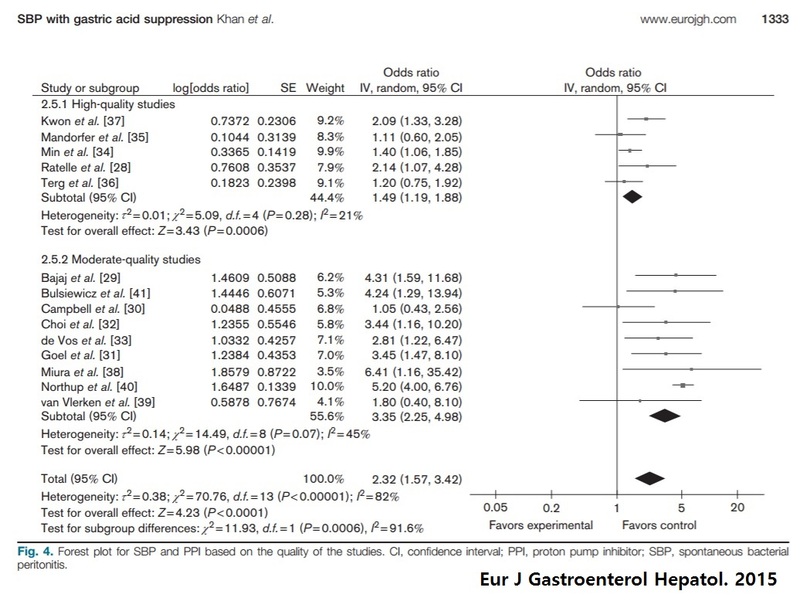 Proton pump inhibitors (PPIs) may be a risk factor for hepatic encephalopathy (HE) in patients with cirrhosis, possibly through translocation of gut bacteria, which can also lead to spontaneous bacterial peritonitis (SBP). We examined the associations between PPIs and development of HE or SBP in patients with cirrhosis with ascites. We used data from three 1-year trials of satavaptan for ascites control. We used Cox regression to compare HE and SBP rates between users and nonusers of PPIs. At inclusion, 39% of the 865 patients with cirrhosis with ascites used PPIs, 52% used them at some point during the follow-up, and the proportion of current users was always in the 30%-39% range. There were 189 first-time HE episodes during the follow-up, and the cumulative 1-year risk was 31% for those who used PPIs at baseline versus 25% for those who did not. The confounder-adjusted hazard ratio (HR) of HE for current PPI use versus current nonuse was 1.36 (95% confidence interval [CI], 1.01-1.84). The HR for overt HE was higher (adjusted HR = 1.88; 95% CI, 1.21-1.91). During the follow-up, 86 patients developed SBP. The adjusted HR of SBP for current PPI users versus nonusers was 1.72 (95% CI, 1.10-2.69). PPIs were used by 52% of this international cirrhosis cohort during a 1-year period and was a risk factor for developing HE and SBP. These findings are consistent with the hypothesis that PPIs may increase translocation of gut bacteria. 3. PPI와 SBP에 관해서는 SMC에서도 좋은 data를 보여준 바 있습니다. 민양원 교수님이 삼성서울병원 자료를 분석한 결과를 소개합니다 (Min YW. Aliment Phar Ther 2014;40:695). BACKGROUND: The risk of spontaneous bacterial peritonitis (SBP) associated with proton pump inhibitor (PPI) use has been raised in cirrhotic patients with ascites. However, this is based on case-control studies, often with a small series. AIM: To determine whether PPI use increases the risk of SBP using a large cohort. METHODS: This retrospective cohort study included 1965 cirrhotic patients with ascites diagnosed between January 2005 and December 2009. The SBP incidence rate was compared between the PPI and non-PPI groups before and after propensity score matching to reduce the effect of selection bias and potential confounders. Multivariate analysis was conducted to confirm the association of PPI use with SBP. RESULTS: After excluding 411 patients, 1554 were analysed. Among them, 512 patients (32.9%) were included in the PPI group. The annual SBP incidence rate was higher in the PPI group than in the non-PPI group (10.6% and 5.8%, P = 0.002) before matching. 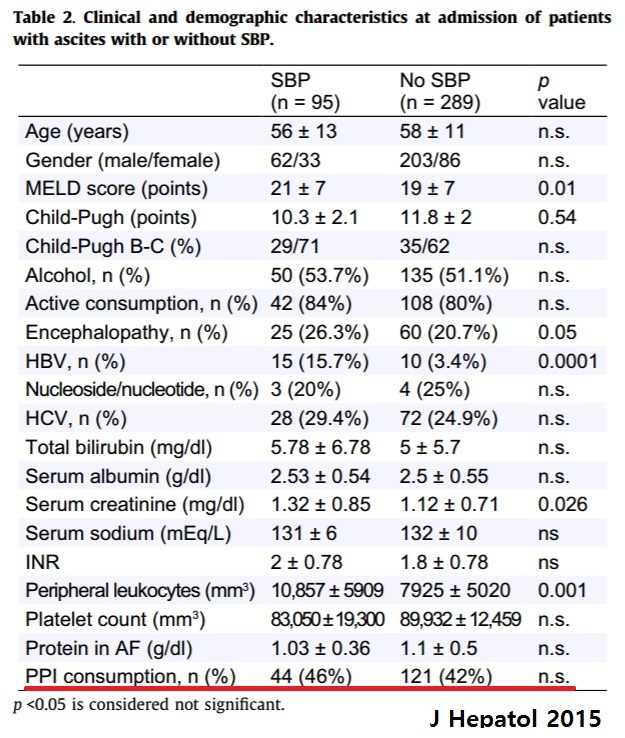 Indications for PPI use and dose of PPI were similar between patients with and without SBP. In the propensity score matched cohort (402 pairs), the SBP incidence rate was also higher in the PPI group than in the non-PPI group (10.8% vs. 6.0%, P = 0.038). Multivariate analysis revealed that PPI use (Hazard ratio 1.396; 95% confidence interval, 1.057-1.843; P = 0.019) was the independent risk factor for SBP. CONCLUSIONS: Proton pump inhibitor use significantly increases the risk of spontaneous bacterial peritonitis in cirrhotic patients with ascites.Proton pump inhibitor use should be undertaken with greater caution and appropriately in patients with cirrhosis. PPI가 SBP에 주는 영향을 민양원 교수님께서 discussion에 다음과 같이 정리해 주셨습니다. 제 생각에 핵심이라고 생각한 부분만 발췌했습니다. 1. PPI가 SBP위험을 높이는 이유를 아래와 같이 설명해 주셨습니다. Small intestinal bacterial overgrowth is a predisposing factor to SBP in patients with cirrhosis. PPI use may increase bacterial overgrowth within the GI tract.Thus PPI use has been proposed to contribute to SBP. 2. 짧은 PPI 사용도 주의해야 한다고 알려주셨습니다. 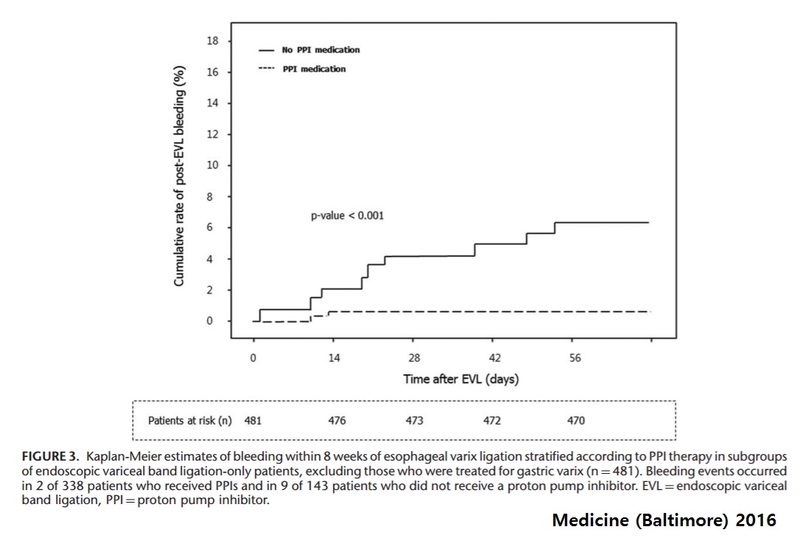 even 1 week of PPI use increases the incidence of SBP in patients with ascites. 3. H2RA의 사용은 SBP 발생과 연관이 없다는 것도 알려 주셨습니다. 그래서... 제 나름대로 복수가 있는 간경변 환자에서 PPI의 적절한 indication 및 duration을 생각해 보았습니다. 아래는 근거는 없는 제 의견입니다. 이준행 선생님. 복수가 동반된 간경변 환자에서의 PPI 사용에 대한 선생님께서 생각하시는 적응증을 여쭈어봐도 좋을지요? 이번 LiverTODAY 내용이 매우 유익했습니다. 신동현 교수님의 제안에 대체로 동의합니다. 두 가지 의견 드립니다. (1) 용량도 중요할 것 같습니다. 특별한 경우 아니라면 half dose PPI를 사용해도 무난하지 않을까요? PPI standard dose는 매우 강력한 산분비 억제력을 가집니다. Half dose로 충분히 치료되는 예가 많습니다. 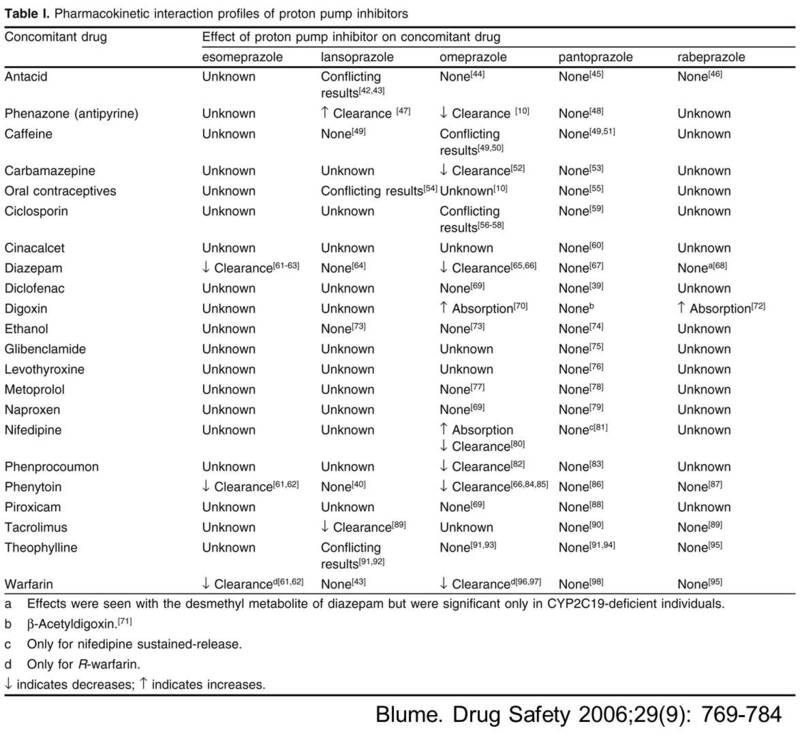 Drug interaction 이슈도 있을 것 같습니다. 대부분의 PPI는 간에서 대사되는데, 간질환이 있는 분이므로 용량을 줄이는 것도 가능하지 않을까요? (2) 만성간질환 환자의 비특이적 소화불량증에 H2RA를 사용할 필요는 없을 것 같습니다. 신동현 교수님의 LiverTODAY 10회 (PPI use in liver diseases)에 대한 수석 전공의 한 분의 편지입니다. 소개합니다. 멋진 내용 잘 보았습니다. 민양원 교수님 회진시에도 PPI 남용과 장내 정상세균총 파괴 등에 대해서 충분히 들은 바가 있었기에 더욱 유익했습니다. 병동에서 LC 환자의 GI bleeding 의심 시 무조건 PPI CIV 와 Terlipressin을 시작하는 경향이 있습니다. 내시경 이후에는 출혈 원인에 따라 약제를 다시 한 번 검토해야 하는데 병동 주치의들이 EVL 환자에서도 PPI CIV를 끊지 않거나 PPI standard dose를 하루에 한 번씩 투여하는 경우를 자주 목격합니다. 발견할 때마다 주의를 주고 있지만 바쁜 주치의 생활 때문인지, 지식이 부족한 것인지는 잘 모르겠습니다. 약을 끊을 줄도 알아야 한다는 것을 주치의들이 좀 더 빨리 깨달을 수 있다면 좋겠습니다. 감사합니다. 적절한 지적입니다. Varix bleeding인 것으로 확인된 상태에서 PPI를 계속 사용하는 것은 어처구니 없는 일입니다. 약은 꼭 필요할 때 사용해야 효과가 있습니다. 필요하지 않은데 사용하면 부작용만 있을 뿐입니다. 투약의 적응증만 가르치고, 약을 끊는 것의 중요성을 가르치지 않았던 교수들의 잘못이 큽니다. 저부터 알게 모르게 자본주의 의료의 영향을 받고 있는 것인지도 모릅니다. 제가 전공의 시절 이효석 교수님께서는 "왜 이 검사를 했는가? 왜 이 약을 투약하였는가? "라는 질문으로 유명했습니다. 불필요한 CBC 검사, 의미없는 초음파 검사 등을 처방했다가 들키면 큰 꾸지람을 들었습니다. 그런데 최근의 교수들은 "왜 이 검사를 하지 않았는가? 왜 이 약을 투약하지 않았는가? "라고 묻고 있을 뿐입니다. 필요한 검사나 투약을 하지 않으면 여기저기서 지적당하기 쉽습니다. 법적으로도 불리합니다. 방어진료라는 이름의 과잉 검사나 과잉 투약은 흔한 일이 되었습니다. 과잉 검사나 과잉 투약의 해악은 생각보다 엄청납니다. 다만 드러나지 않을 뿐이지요. 저부터 "약을 끊을 줄도 알아야 한다"는 것을 강조하는 교수가 되겠습니다. Varix bleeding 환자가 불필요하게 PPI를 맞고 있으면 한바탕 난리를 치겠습니다. 환자를 위하여. 신동현 교수님의 LiverTODAY 10회 (PPI use in liver diseases) 및 저의 comment (Varix bleeding 환자가 불필요하게 PPI를 맞고 있으면 한바탕 난리를 치겠습니다. 환자를 위하여.) 등에 대한 애독자 의견을 소개합니다. 여러 선생님들의 의견 잘 들었습니다. 제 의견을 보태자면, LC 환자에서의 무분별한 PPI 사용에 대한 지적은 타당합니다. 하지만 PPI가 SBP나 PSE 위험도를 높인다는 주장은 여전히 debate가 있는 내용입니다. 독자들이 이에 대해 오해가 없었으면 합니다. 최근 메타분석(Khan MA. Eur J Gastroenterol Hepatol. 2015)에서 quality 높은 연구들만을 분석하였을 때 PPI와 SBP와의 연관성은 미미하였으며, 그동안 수행되었던 가장 규모가 큰 prospective 연구(Terg R. J Hepatol 2015)에서 PPI와 SBP와의 연관성은 없었습니다. 그리고 신동현 선생님이 소개한 Dam et al, Hepatology 2016 논문에 대한 코멘트 글도 살펴 보시기 바랍니다 (Ali Khan M. Hepatology 2016). EVL을 하였음에도 불구하고 PPI를 사용하는 이유는 주치의들의 무지함이나 개념없음 때문만이 아니라 PPI 사용이 post-EVL bleeding을 낮추기 때문입니다. 이 연구 결과가 최근 국내 연구자들에 의해 보고되었습니다 (Kang SH. Medicine (Baltimore) 2016). 물론 이는 prophylactic EVL을 대상으로 한 연구였고 후향적 연구라는 큰 제한점이 있기는 하였지만 기전적으로 그럴듯한 만큼 과거부터 임상가들이 종종 EVL 이후 PPI를 유지하였습니다. 저도 이에 대해 10여 년 전 고광철 선생님께 경험을 전수받아 지금도 이렇게 practice를 하고 있습니다. EVL후 PPI사용에 대한 두개의 RCT를 추가로 말씀드려야 할 것 같습니다. 두 연구 모두 PPI사용이 post EVL 환자에서 더 좋은 결과를 보았습니다. 저는 출혈로 내원한 간경변환자에서 varix bleeding으로 확인된 환자들도 short-term PPI를 사용하고 있습니다.^^ 복수를 동반한 간경변 환자에서 간성혼수나 SBP 발생에 가장 중요한 유발인자가 PPI 사용은 아닐 것으로 생각합니다. 지난번 소개드린 논문은 복수가 동반된 간경변 환자에게 PPI 사용함에 있어 항상 약제 사용에 따른 risk benefit 을 생각해야 한다고 이해해 주시면 감사하겠습니다. 제가 주로 최신 연구를 소개해 드리고 있습니다. 최신 연구 결과를 바로 임상에 적용하기 전 반드시 몇 가지를 생각해 볼 것을 권한 좋은 Review가 있어 EndoTODAY 독자분들께 소개합니다. 보다 균형된 시각으로 LiverTODAY를 보내드리도록 노력하겠습니다. 곽금연 교수님, 신동현 교수님. 감사합니다. 간경변 환자의 정맥류 출혈에 대한 EVL 후 단기간 PPI를 사용하는 것이 나름대로 근거가 있는 치료임을 알았습니다. 공부가 부족한 상태에서 오만한 발언(Varix bleeding 환자가 불필요하게 PPI를 맞고 있으면 한바탕 난리를 치겠습니다. 환자를 위하여. )을 했던 점 사과드립니다. 앞으로 varix bleeding 환자가 병동에서 PPI를 맞고 있어도 한바탕 난리를 치지는 않겠습니다.^^ 대신 "이 환자는 EVL을 받았고, 소화성 궤양이 없다는 것이 확인되었는데 왜 PPI를 쓰고 있는지 그 이유를 알고 계십니까? "라고 조용히 물어보고, 혹시 모르면 친절하게 가르쳐 주겠습니다. 신동현 교수님께서 소개한 NEJM 리뷰(The primary outcome is positive - is that good enough? )의 결론을 옮깁니다. "A significance level of 5% for the primary efficacy outcome is the minimum requirement if a trial is to be declared “positive,” and this level of significance should prompt deeper inspection into study processes and outcomes. Determining whether the evidence justifies the announcement of a major advance in medical care or a more cautionary note that further studies are warranted requires a comprehensive approach to all available evidence by various stakeholders. If the efficacy and safety outcomes of the trial are convincingly met, the next step is to evaluate its overall quality and internal validity. It must also be determined whether the findings translate into treatment effectiveness (and net clinical benefit) in real-world patients. However, caution is required when data from nonrandomized registries are used to confirm or refute trial findings, given the potential for selection bias and residual confounding when such registries are used. At the same time, gauging the cost-effectiveness of treatments across different types of health care systems will determine the level of reimbursement (which in turn will affect the adoption of a new therapy). For a new drug, the question of whether the results of a pivotal trial will satisfy the requirements for approval established by regulators (e.g., FDA and the European Medicines Agency) depends on the totality of the evidence from the trial and from all previous, related studies. Often, further evidence is required to clarify the safety profile of a new drug, and approval may depend on the sponsor’s willingness to undertake additional safety studies (by means of randomized trials or observational registries). 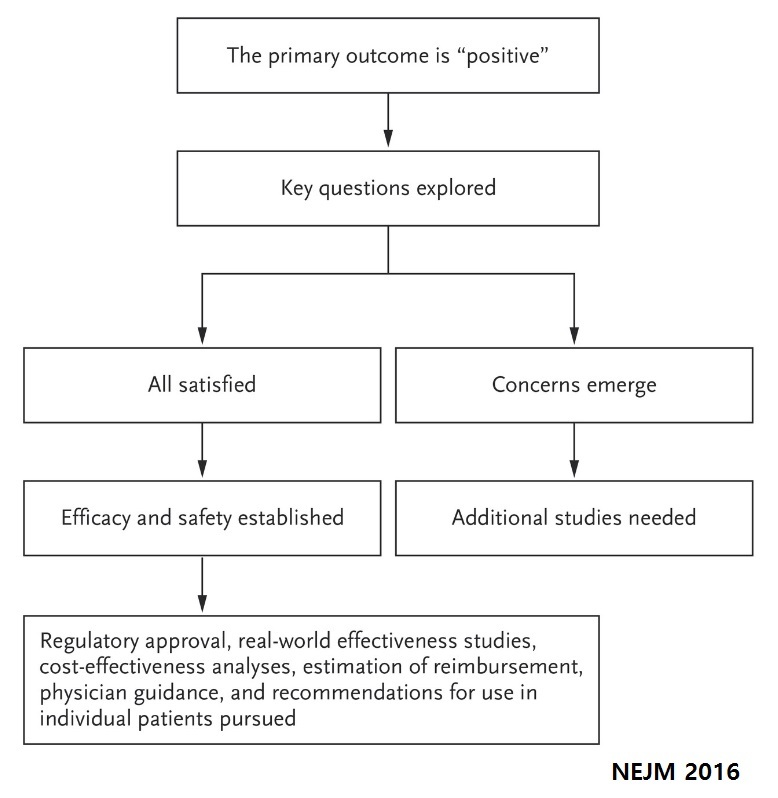 Societal guideline committees play an important role in synthesizing the knowledge base and classifying the strength of evidence for new treatments; their endorsements strongly affect practice. Ultimately, however, physicians at the point of care bear the final responsibility for accurately interpreting clinical trial results and for integrating regulatory and guideline recommendations in order to make the best treatment decisions for each patient in their care. "